Marin’s renaissance man breaks bread with organizations all across the bay. Despite being able to officially claim the moniker of “retired,” part-time Bolinas resident Mark Buell is anything but. And he doesn’t appear to be letting up. After a successful 35-year career working in both public and private real estate development, this dynamic 69-year-old turned to public service, bringing his time and talents to some of the Bay Area’s most impactful organizations. He’s a decorated Vietnam veteran with two Bronze Stars who served as San Francisco’s first Director of Economic Development and later helped found CALE D, the California Association for Local Economic Development. Buell is a dedicated public servant, in the truest sense of the term. He currently helms the ship of both the San Francisco Recreation and Parks Commission and the Golden Gate National Parks Conservancy, bringing legendary fundraising skills to the table to ensure Bay Area parkland remains accessible to the public and protected for future generations to enjoy. Projects championed by Buell include the $35 million restoration of Crissy Field and the development of Cavallo Point. His latest civic act? Helping to bring the world’s most prestigious yacht race — and with it, the economic benefit that comes with thousands of additional tourists — to the Bay Area. We caught up with Buell as the America’s Cup teams were prepping for their second San Francisco stop in the America’s Cup World Series (October 2–7), where they will be competing amidst another one of the Bay Area’s great civic events, San Francisco’s Fleet Week. How did you get involved in community service work? I retired at 52 but kept my hand in building houses until I was 58. I enjoy my downtime, but I’ve always been very involved in the community. My whole life, I’ve had this vivid memory of my father Roy (who was general manager for Pacific Telephone and Telegraph Company) being civically engaged. He served on many civic boards and commissions, such as the San Francisco Chamber of Commerce and Redevelopment Agency Commission, as well as the Convention and Visitors Bureau (now called SF Travel). I just naturally followed in his footsteps. And I’m passionate about work. “Civically engaged” seems to mean many different things to you. What are some of the hats you’re wearing today? I chair the board of the Golden Gate National Parks Conservancy and I’ve been the president of the Recreation and Parks Commission for the past two years. We’ve partnered these organizations together, and done a number of things to enhance the visitor experience, including building visitor centers at Crissy Field and Muir Woods. We’ve created what I believe is the gold standard in park partnerships, so I’m proud to be going to New York City to help build a similar partnership. I also serve as chair of the Edible Schoolyard Project, formerly the Chez Panisse Foundation, for more than 10 years, where we teach sustainable gardening, harvesting and cooking. One of my favorite programs is our Edible Schoolyard Academy each summer, in which teachers from around the country can come and learn about edible education in a real hands-on way. And we hear that you are a pretty good auctioneer. Being an auctioneer enables me to help more organizations I like to support. I think I do more than 10 auctions a year. Some of the groups I’ve done recently include Human Rights Watch, Trout Unlimited, National Resources Defense Council, Oxbow Schools, Gladstone Institute, North Beach Neighbors and the Bolinas Art Museum. I don’t do the fast-speaking bit or anything like that. I prefer to engage the crowd and focus in on the individuals. It’s pretty fun stuff. Your latest captain’s hat comes in the form of the America’s Cup Organizing Committee. What do you think the Cup will do for the region? I think the Cup is going to be more exciting than people believe it will be. Picture 13-story buildings moving across the bay at almost 50 miles per hour. But more importantly, I think the 2013 events will really build up the Cup’s brand and it will be even bigger next time. All of this excitement is going to do good things for the city. You’re a San Francisco native, but have a home in Bolinas. How do you split your time? I’m a fourth-generation San Franciscan, but my wife Susie and I live part-time in Marin and are increasingly spending more time there. I must say that waking up and looking out across the national park and the lagoon puts me in a damn good mood. What does downtime look like to you? I really enjoy golf and fly-fishing, and also the fabulous beaches in West Marin. We live in paradise. But my favorite time is just being at home, surrounded by our grandkids, our two Jack Russells and our chickens. I have a wood-fired oven where I will happily spend the weekend cooking up these great local vegetables and meats. Bolinas has these wonderful farm stands so we don’t ever feel like we have to go out to get a great meal. My favorite way to relax is baking with the grandkids at home. I’ll take a whole day and bake a dozen or so loaves of bread. I bake so much bread we have to give it away. What’s a perfect Marin day trip for Cup fans looking for a little getaway? Start with a hike along the coast of West Marin — all of the hikes are just gorgeous — and then head up to Point Reyes. First stop is this great independent bookstore, Point Reyes Books, where you can still get The New York Times. Then it’s off to Cowgirl Creamery. I love their Mt. Tam cheese. What’s your advice for those looking to get civically engaged? Look for work that makes a local impact. If you want to change the world, start local and change the world that is right around you. We’re very involved in Bolinas and try to help out with as much as we can. There is so much to be done right in your own backyard. 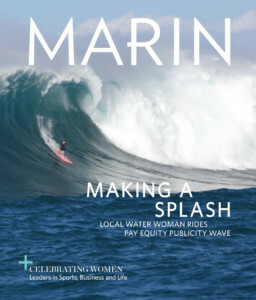 Marin Community Foundation is a great example. I sit on their advisory board on housing. Tom Peters and his team are doing really great work, making a real difference, right here in our community.